Every space was used to its best potential. 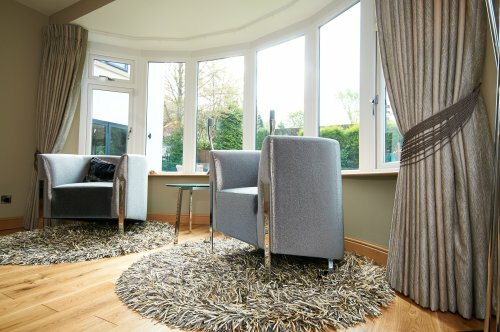 In this dining room, a sunny bay window was used for an informal sitting area with comfortable tub chairs. Nothing is as simple as it appears at first glance. These chairs were made to order in Portugal and have a sleek chrome frame and upholstered in a fabric entirely covered in tiny glass beads. They sparkle playfully in the sun shine streaming through the bay window. The rounded shape of these chairs is emphasised further by the round rugs on which they sit. These shaggy pile rugs were bespoke made in Belgium.